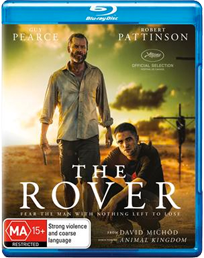 Home entertainment review: The Rover - A haunting Australian western | SWITCH. Director David Michôd had one hell of a task ahead of him with his follow-up to ‘Animal Kingdom’ (2010). His debut film was not only a commercial and critical success, it became part of the Australian film culture, ushering in a new and exciting talent. With ‘The Rover’, he leaves the labyrinthian character-driven saga behind and drives into the middle of the Australian desert to craft a subtle and meditative fable of a broken civilisation and the men left scuttling over it. In an undefined future after a financial apocalypse, a man (Guy Pearce) travelling through the desert alone has his car stolen. He is determined to get it back, enough that he will furiously pursue the thieves for hundreds of miles, his only guide a young American man Ray (Robert Pattinson) injured and abandoned by his brother Henry (Scoot McNairy), one of the criminals. The landscape and the setup might sound like Michôd is walking the same territory as ‘Mad Max’, but ‘The Rover’ is a far more spartan and thoughtful film that you may expect. The screenplay keeps dialogue to an absolute minimum, especially when it comes to the central protagonist, Guy Pearce playing an Australian variant of the Man With No Name. Instead, the faces of the remarkable cast and the vast emptiness of the Australian landscape speak the volumes that need to be said. Cinematographer Natasha Braier somehow finds a way to shoot the landscape in a manner that makes it new and intriguing rather than the same boring tropes we’ve become so used to. The film looks and sounds spectacular, a modern western that sits comfortably next to the likes of ‘The Proposition’, and one that demands that its audience works for its payoff. ‘The Rover’ doesn’t easily reveal itself, rather asking you to take in the details and fill in the gaps. It’s a brutal film, both in terms of its violence and its emotional force, bolstered by brilliant performances from Pearce and Pattinson, who turn out to have terrific chemistry. At its heart, the film is a simple fable of a man trying to define himself in a world that is in the process of dying, a quiet requiem for humanity and civilisation. By stepping away from the characters and narratives that made ‘Animal Kingdom’ so breathtaking, David Michôd has proven himself much more than a one-trick pony, and instead the real deal, a genuinely breathtaking Australian talent. ‘The Rover’ takes its time to kick into gear and asks a lot of patience and involvement from its audience, but it’s an incredibly accomplished piece of filmmaking, and for those who connect with it, a tremendously satisfying one. In a year already packed with great Australian films, ‘The Rover’ is one most definitely deserving of attention. Roadshow have gifted ‘The Rover’ with an excellent 1080p 2.35:1 transfer that captures Braier’s careful photography and production designer Josephine Ford’s very specific and gorgeous colour palette. Detail is excellent throughout, with the film favouring a more organic look rather than a digital one. It also has an excellent DTS-HD MA 5.1 track that captures the intricate sound design and haunting score by Anthony Partos. With so little dialogue in the film, sound becomes incredibly important, and the balance of the track makes ‘The Rover’ an engaging and immersive audio experience. The film looks and sounds spectacular, a modern western that demands that its audience works for its payoff. If only more films could have a collection of features as handsomely produced and as engaging as those included on this disc. The main feature is ‘Something Elemental: Making The Rover’, an excellent three-part documentary that covers the development, casting and shooting of the film. Running at almost 45 minutes, the cast and crew speak candidly about the process, including the unusual casting of Pattinson and the care and attention paid to the production design. It’s complemented by an even more candid commentary from Michôd. He begins by expressing concern at doing the commentary alone, but quickly launches into a detailed description of his thoughts behind the film and the world he was attempting to create, as well as his understanding of the experience of the film from an audience perspective. The features are rounded off with a recording of the Q&A that followed the screening at the Sydney Film Festival this year.